Dhapate, in Marathi, usually means a sharp slap on the back. These pancakes, similarly, derive their name from being slapped onto the griddle. They are a close cousin of ‘Thalipeeth’ – a fiery, tear inducing version of the same and also served with some ghee and pickles. Dhapate are traditionally made from jowar (millets or sorghum) flour while Thalipeeth is made from a mixture of wheat, gram and other flours. As with most gluten free flours, this one lacks elasticity and is difficult to roll out, so you use your wet palms to pat them into shape and ‘slap’ them onto a hot griddle. There’s something very satisfying with kneading the dough, shaping it and hearing the dhapate sizzle in the heat. I have made mini ones that can be dipped into a sauce or used as a scoop for dips. Be sure to serve them hot and watch them disappear. The only thing you will be smacking is your lips. In a large bowl, sift the flour and the salt. Add the onions, garlic, chilli, sesame seeds, peanuts, paprika. Add about 3-4 tablespoons oil and knead the dough using water sparingly. You need a firm but pliable dough. Heat the griddle and brush it with the melted ghee. Divide the dough into 12-15 balls, about the size of golf balls. Wet your palms and flatten each ball into a disc, pressing down to make sure you have an even thickness all over. Slap these discs down on the griddle. Brush them with some more melted ghee, drizzling some around the circumference too. Turn them over after 3-4 minutes, ensuring they are golden brown on both sides. Place them on paper towels to get rid of any excess ghee. Serve hot with ketchup or a yoghurt dip. 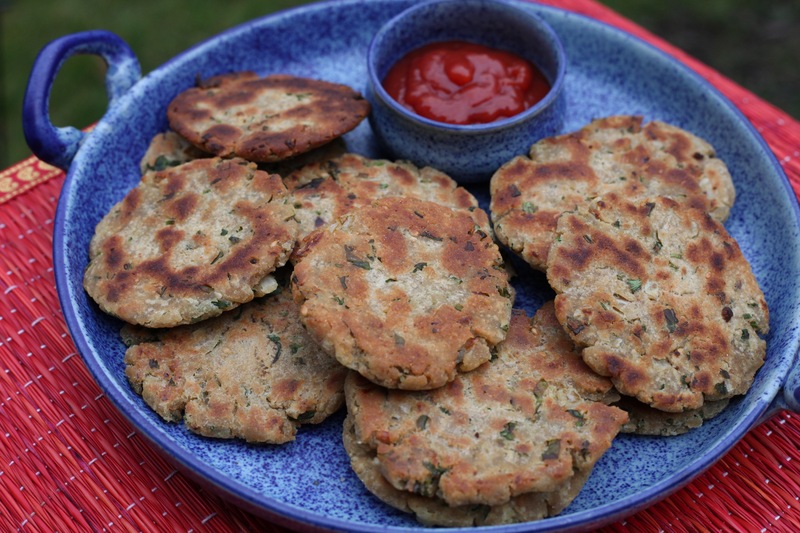 This entry was posted in A-Z 2016, Savoury snacks, Teatime snacks or Brunch ideas and tagged #AtoZchallenge, dhapate, epicurious, gluten free, gluten free brunch, jowar, Maharashtrian brunch, millet, Mumsnet Blogging Network, thalipeeth, Yummly. Bookmark the permalink. Haven’t tried them, but don’t mind trying them out! I did stay in Pune for 2 years, but didn’t came across these.